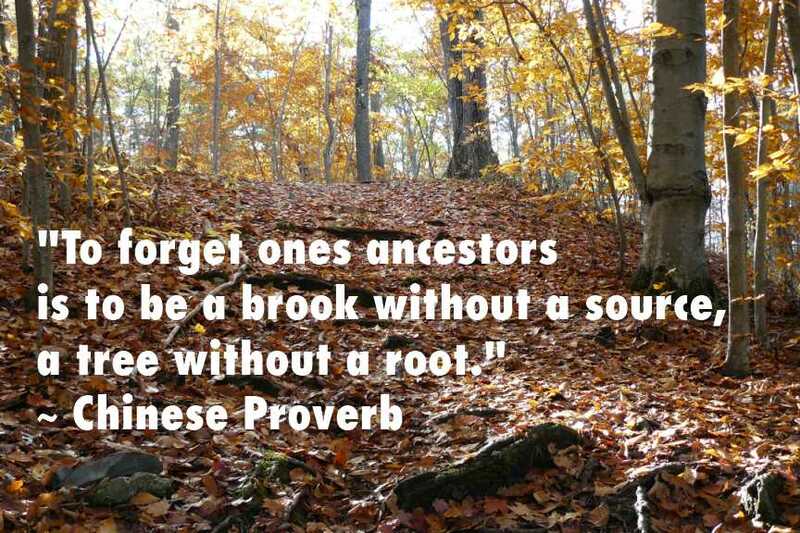 Some discussion has come up recently in my family regarding some of the names in my family tree. Most people in the family are intrigued when I tell them about some of the most common names but it’s in the unusual that I usually get the biggest response. The first names George, James, John and William appear on all 4 sides of my family tree (Hill, Porter, Hyde and Lovejoy). All names of kings and perhaps proving my families monarchist leanings. Thomas, Robert and Henry appear in 3 of the 4 sides. Looking at common male first names in my entire tree, there are 22 named George, 21 named James, 20 named Henry, John, Robert, Samuel, Thomas and William. My ancestors really liked names starting with the letter J. On top of the traditional Jeffrey, John, Jonathan, Joseph and James, there have been Jobus, Jabez, Joshue, Jared, Jacob and even Johann. At least one side of my family tree turned to the bible for inspiration. Uncommon by today’s standards, ancestors along the Hyde/Marcy/Lovejoy/Young side of my family named their sons Moses, Obadiah, Amos, Abraham, Isaac and even Eleazer. Knowing I have Quaker roots on my Marcy line, it should come as no shock to see the names Calvin and Freeman in my family tree. Samuel Willson is the most common name on my Lovejoy/Young side. Four generations with the name Samuel Willson were born into my chart starting in 1681. There is speculation online that at least one signed the Declaration of Independance and another was the inspiration for the phrase Uncle Sam. If your name is John on my pedigree chart, you most likely married an Elizabeth. Other than 3 who married a Nancy, Mary and Helen, all of the other John’s married a woman named Elizabeth. Not suprisingly, Elizabeth is the most common female name on my entire tree with 21 Elizabeth’s and 17 Eliza’s! The oldest male name on my English Hill side is 7th great grandfather James Alldwin who was born in 1700. It should come as no shock that his wfe was named Elizabeth. On my Scottish Porter side, my 6th great grandfather Archibald McMaster is the oldest male name. He was born in 1726 on the Isle of Arran off the Scottish coast. The oldest male name on my Scottish Dryden side is my 7th great grandfather Robert Cairns who was born in 1680. My 2nd great grandfather Henry Hyde has the oldest male name on my Irish Hyde line. He was born in/around 1839 in Ireland and due to unrest and such I wrote about in this blog, I haven’t been able to trace any further back. One of the oldest male name in my line comes from the Marcy side. Geoffrey Massey, my 9th great grandfather, was born in 1563 in a place called Knutsford, Cheshire, England. Many of this line came to America and settling in Massachusets (New England). It was here that the family name morphed into the Marcy it is today. I don’t have birth or death dates but I know my 9th great grandfather Ralfe Wilder married Mary Hazel in 1691. I believe this would make his name the oldest on the Lovejoy line. And lastly, The oldest male name on my Young family line belongs to my 13th great-grandfather, William Wilson (Willson?). Born in 1542 in Wellsbourne, Lincolnshire, England. He married Isobel Woodhall in the 1570’s and died in Windsor, Berkshire, England in 1615. How about you? Have you found any interesting names/facts down your family tree lines? Share them in the comments below. Note: this is the eighth installment in my own version of #52ancestors where geneabloggers have been asked to write about a different ancestor every week for a year. To understand the concept, read my blog entry from January 19, 2014. My family tree has many twists and turns but none have been more controversial as my great-grandmother Lillian (Lilly) May Young. She was born in Jerseyville, Ontario, Canada which is part of Ancaster township. She was the oldest of 4 children to Ira Elmor Young and Mabel Ethel Misener. Her birthdate was February 12, 1901. In the 1911 census, 10-year-old Lilly May is listed as living at 106 Arthur Street in Brantford, Ontario, Canada. She lived with her parents and her siblings Cora – 8, Lawrence – 5 and Elmer – 10 months. The family is all listed as having Dutch origins and Canadian nationality. They are all listed as Baptist. Looking at the streetview on Google, the house looks like it hasn’t really changed much. All the houses look to be over 100 years old. The street is located pretty close to the downtown core of Brantford. Lilly’s father is listed as a labourer at a machine shop and Lilly is listed as a student. As yet, I cannot find Lilly on the 1921 census, but I do know that her soon to be husband Victor Wilfred Lovejoy was living in Hamilton with his parents at 35 Wentworth Street North. He is listed as 15 years old. On April 29, 1922 life changes for Lilly and Victor as they exchange wedding vows. Some slight fibs were told on both of their parts, as Lilly states she is 20 years old, when in fact she is 21. Victor’s lie is even larger of as he states that he is 19 years old and yet by being born November 6, 1905, he would only be 16 years old. The pair were married in Hamilton where both of them lived at the time. 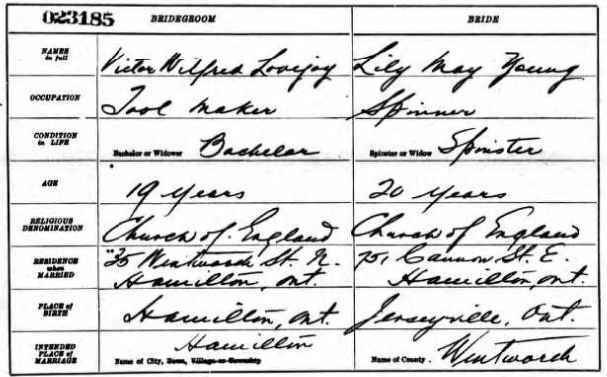 On April 29, 1922 Victor Wilfred Lovejoy was listed as a 19 year old tool maker and Lily May Young was a spinster of 20 according to this record I found on this marriage record on Ancestry from Archives of Ontario; Series: MS932; Reel: 630. It would appear that Lilly May Young wasn’t only lying about her age at the time of the wedding. Her oldest son Ronald Lovejoy was born in September of that same year, only 5 months after they exchanged vows. Two years later, little Raymond Lovejoy came along. And two years after that my grandmother Betty May Lovejoy came into this world. 3 children – all under the age of 6. I can’t imagine life was easy for any of them. All of my life, I have heard that my grandmother’s mother had died in childbirth with my grandmother. I didn’t know her name and in fact, knew nothing about her. I knew that my great-grandfather had asked someone to come and help him raise his kids, and that he had married her as he had 3 more children (2 more boys Ben and Ted and 1 girl Saundra). But I knew nothing when I started my genealogy journey. A few years back I became obsessed with finding out where I came from. My grandmother was gone and my mom had also passed – there wasn’t anyone I could get answers from easily. I turned to ancestry.ca and began looking into things and before I knew it I had the marriage certificate. A few weeks later I found her birth and death certificate. I felt the mystery was solved and brought my information to the Lovejoy Family reunion. I had both of Victor’s marriage certificates and the death certificate of my great-grandmother. It was a pretty big deal and answered my questions. Only it didn’t answer everyone’s questions. My grandmother was born on May 28, 1926. My great-grandmother died November 27, 1927. There is no way that my great-grandmother died giving birth to my grandmother. It was all in black and white and staring at me in the face but it didn’t click in until someone brought up the story again about how my grandmother died in childbirth. But she didn’t die giving birth to my grandmother. How did she die? A well meaning cousin told me a rumor that Lilly had died due to a botched abortion. Could this be true? Was she pregnant but didn’t want another baby with 3 more in the house under the age of 8? This death certificate for Lillian May Lovejoy came from Ancestry and was part of Archives Ontario Registrations of Deaths, 1869-1938. MS 935, reels 1-615. Address: 63 WENTWORTH ST. S.
And that’s where it ended up. Not childbirth. Not an abortion. I haven’t been able to find a headstone on any online databases and at some point I plan on figuring out where she is buried but I believe I might already know. Victor Lovejoy was buried in the Woodland cemetery as well. Even though her name is not on the stone, do you think it’s possible they would be buried together? With the circumstances of her death been concrete in black and white, it really shows the tragedy that was her life. Young and full of promise. No family pictures survive that I know of. I have no images of her. Her husband will also die young at the age of 45. His second wife a few years later at 44. Her children will grow and raise families of their own. They will see their children live and thrive and they will have grandchildren they can love and spoil before they too pass away. No one survives that knew Lillian May Young. All we have are stories that were passed to the younger generation and no one can be 100% sure if they are true. She was only 26 years old. Gone, but I have not forgotten.